Nasty, crappy, non-functioning Selectric I. Shame because it is the best looking and easiest to store Selectric (it is next to a Royal KMM for size comparison). This will be offered to a repairman for parts and if it gets refused it will be scraped. I already pulled at least 4 cigarette butts from it... silly rednecks (this was a free "excellent condition" machine, yeah ok). 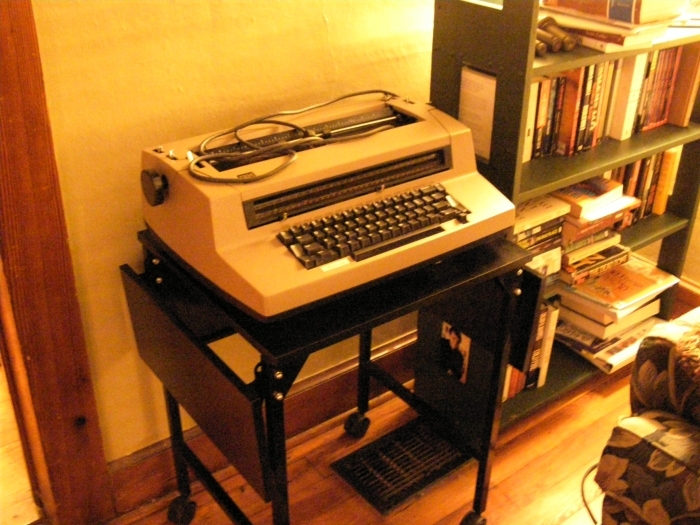 My Selectric II, a good Goodwill find and it came with a dust cover and extra ribbons at a steal price. Yep, got all three Selectrics, you gotta catch em all right? One of my job benefits is occasionally finding these in the warehouse and getting them cheap. Some were broken and that was a loss but these work and overall I have gotten a good deal on these. Jumper was a dumb-name, as of now I christen the III "Humpty Dumpty" for obvious reasons. Boy did I feel stupid/guilty when it flew off the cart. Amazingly it works like a charm with only a crack on the bottom and some screwy hinges for the top-piece which I disconnected. 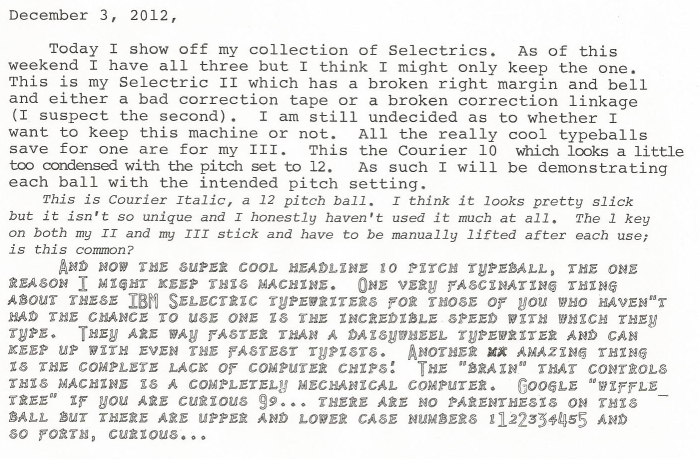 I am very glad to have it because I have had some of these awesome typeballs for a while and they don't work on my II. Dreams do indeed sometimes come true! 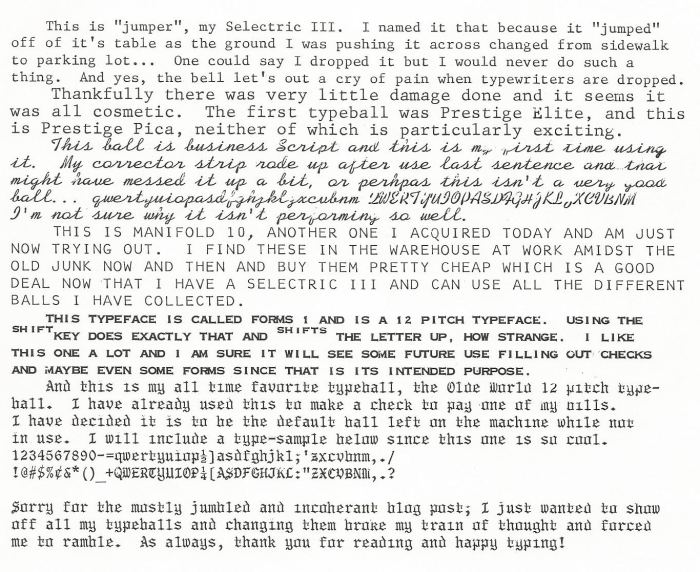 If you haven't yet seen a Selectric in action, you need to. Wow, those are some cool type styles. Headline is unbelievable! Good point, Selectrics are very fast, much faster than the electronic daisywheel wedges. 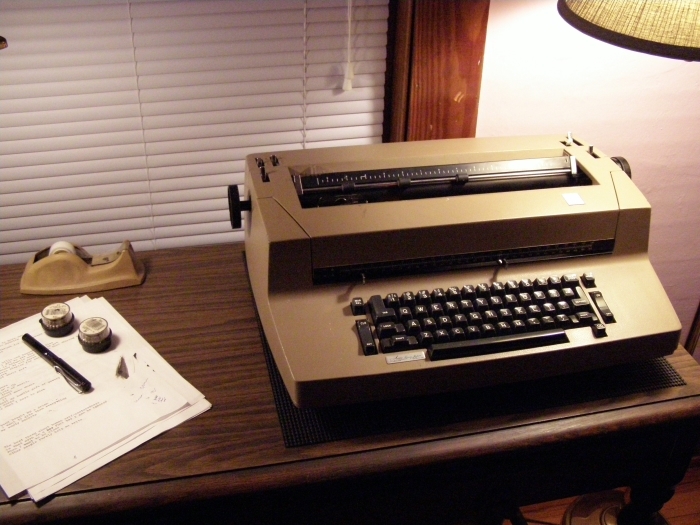 My Selectric II can't be beat for long writing sessions; perfect for working on novels. Unfortunately the return key is not functioning, but I get around that issue by using the EXP and INDEX keys. You have a wonderful selection of type elements! I especially like the Business Script one, which would be great for personal correspondence. Try the Calligraphy type element for a nice script alternative. I haven't found a Calligraphy one, I will keep an eye out though. That sounds pretty awesome. Shame about your return key. Kinda like my II where I have to pay attention to each line since the bell doesn't ring and margin won't stop the thing (not a carriage that moves, I don't know what to call it). 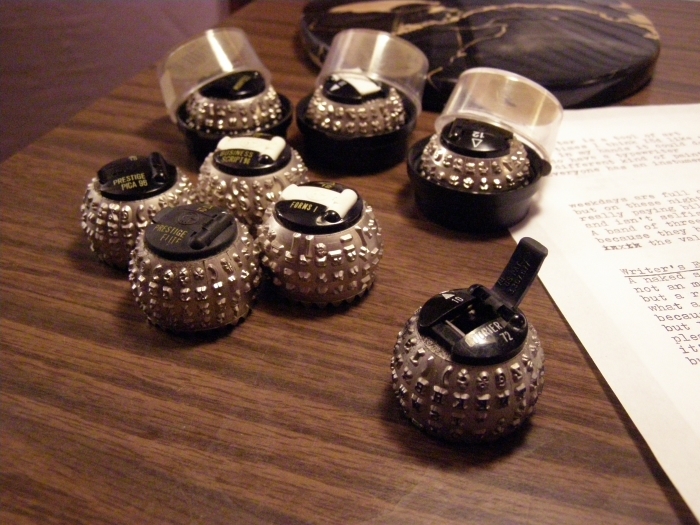 The only thing I don't like about using the Selectric for long writing sessions is the extreme cacophony! They have a selection of both new & used type ball elements. I had to pay full price for a new Calligraphy one, as they don't have that particular one used. I find it interesting that this is a Christian-based website. Their service was prompt and I'll definitely do business with them again. That's a pretty cool site, lots to choose from. I'm gonna keep hunting in the warehouse every now and then to see what turns up. I'll have to run through your blog and find the calligraphy ball in use, I'm sure I've seen it before. 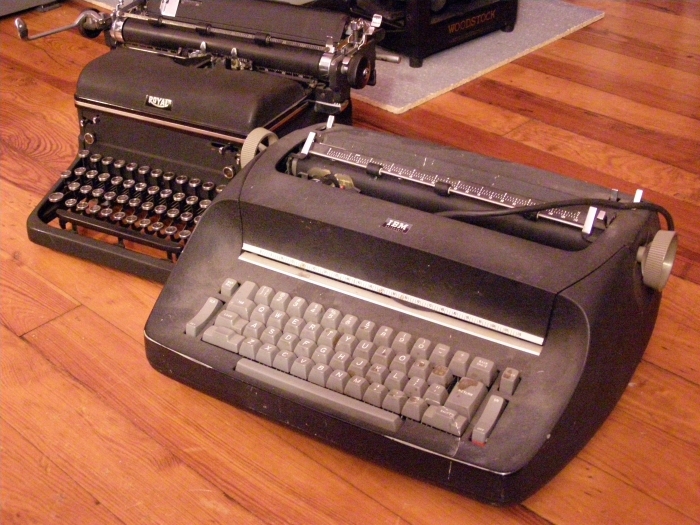 I have an IBM wheelwriter 5 and a Selectric and the selectric is the finer typing machine. The Wheelwriter has some fun gizmos; automatic return, automatic centering, but they are just gimmicks. 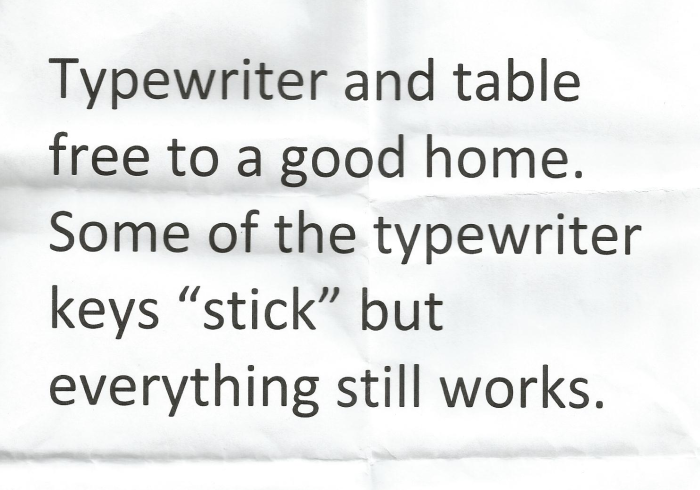 Your post makes me want to get out the old Selectric and type a few words. Great post and great type elements! don't discard broken type balls (elements)!! What usually breaks are the clips on top. I've repaired any number of them by taking the working tops from elements that I consider useless, like the astrology element, or from cracked elements/elements with broken teeth, that just can't be fixed. I did once discard a pretty cool one that hadn't worked... I didn't even think to fix it. At least it was just the one! I've been thinking of getting a Selectric myself sometime... Heh heh. You can fix the A key by removing the platen, lift up the top cover and with a screw driver unlatch the Top cover latches located one on each side of the typewriter body. 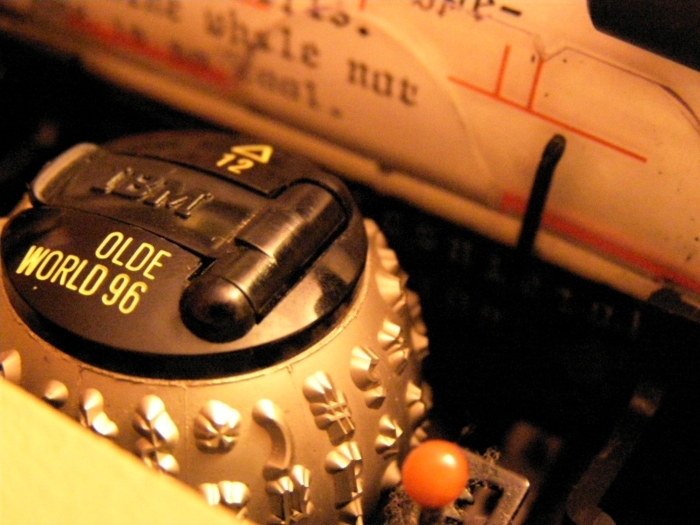 Take off the cover and on each side of the typewriter you will see a small pin protruding out of the macine around the side wall near the front of the key board. These are to help you slide the machine towards you, it will come easily, and then you tilt the typewriter up on its back. Now you ar e looking at the under side on the machine. You will otice that each key lever has its own leaf spring to return the key back up, on the A it could have become dislodged in which case it is very easy to return it to its rightful position. Should it be broken, look down on to the base of the machine and you will find it lying there. Don't throw it away! Get a screw driver and loosen the screws holding that large comb of springs and slip in the broken spring where it will come up under the A key. Tighten up the screws and you have repaired your IBM!, congratulations. Reverse all the previous instructions and Bingo, you are ready to go. Give me a call if you should have any difficulties. Hello do u have calligraphy to sale? No, I do not have an extra one, sorry!